Originally just a moisture farmer on the planet Tatooine, the young Luke Skywalker's life began to change forever when he purchased two droids, R2-D2 and C-3PO. Luke met the Jedi Master Obi-Wan Kenobi, the infamous smugglers Han Solo, Chewbacca, and Princess Leia! His actions helped change the fate of the galaxy by assisting the Rebel Alliance against the Galactic Empire and destroying the terrifying Death Star. 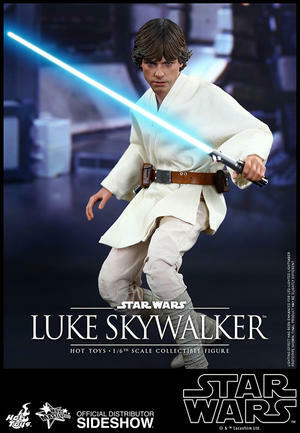 Sideshow Collectibles and Hot Toys are very excited to officially reveal the hero of the original Star Wars trilogy - the Luke Skywalker Sixth Scale Collectible Figure from Star Wars Episode IV: A New Hope! 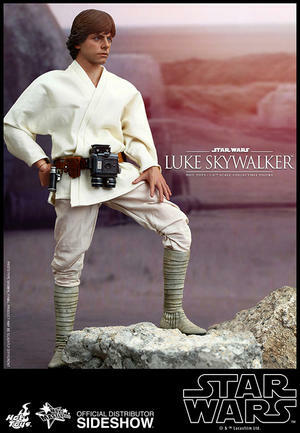 The movie-accurate collectible figure is specially crafted based on the image of Mark Hamill as Luke Skywalker in the film, and features a newly developed head sculpt, specially tailored costume, LED-lighted lightsaber, a hat with goggles, a poncho, detailed accessories and a figure stand. 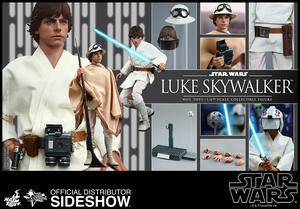 Your Star Wars collection wouldn't be complete without this Luke Skywalker collectible figure!